With the wedding assignments concluding last month, I realized that I had shot 40 weddings since I started my journey a couple of years back. 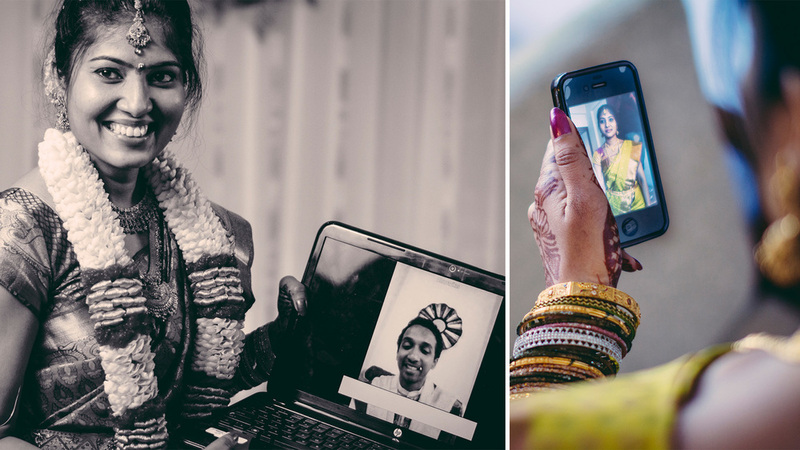 One of the things I have noticed in weddings (and I am pretty sure you have as well) is that the use of technology has been constantly rising over the years. The closest I have come dropping my jaw in awe of the usage of technology was when in April I attended an engagement in JP hotels, Chennai, where I was told the groom couldn't make it from the US so it is going to be just the bride for the ceremony here but not to worry, because they have him here chanting the mantra on skype. Another time, in Chetpet, Chennai, I was shooting an Engagement where the Bride's grandfather was on a video call with the elder sister, describing the the scene at the mandapam on Google Hangouts. It is just amazing how technology has made so many things so easy and user friendly for us. It's all right there and all we need to do is just pick up our preferred gadget. "If you are a guest photographer at a wedding, Do note that I will give you extra brownie points and buy you a box of cupcakes if you use your smartphone or your tab instead of a DSLR. That way you are so much less intrusive and I can get the vantage points that I want more often than not."